The grinning guy in this picture is Francesco Passerini, who happens to be my friend Tom Calloways, son-in-law. Francesco is not that far removed from Borgetto Sicily, which make this whole story even more incredible. This is not only Francesco’s first deer, it’s just his second day of hunting deer in his whole life. To say he was in the right spot at the right time would be an understatement. The deer was just taken this evening, and I got this phone camera picture from the proud father-in-law Tom. Francesco was with Toms son Scott, hunting on the Calloway property in Hillsdale. There are a couple other part owners of this small piece of real estate, but in the 8 years that they have owned it nothing remotely close to this “bad boy” has been taken. In fact Tom has never taken a buck off this property with his gun. He and Scott have taken some good bucks with archery equipment, but Franseco”s buck will probably never be beaten. Tom took Francesco out Saturday, and then had to let Scott take him out today. Tom told Francesco to use his ground blind and even let him wear his insulated camo outfit. He bought a new shotgun last year, and sighted it in, but never hunted. I guess the scope was right on as he dropped this bruiser in his tracks, as he came into a cut corn field. I am not an official scorer, but I know how to score a buck. Just looking at this picture I will say it’s definitely over 160, and could possibly push the coveted Boone and Crockett minimum of 170 inches. It’s a once in a lifetime buck, shot the first time Franseco had ever drawn down on any animal. Now that’s impressive to say the least. But there is more to this story about the “Lucky Hunter from Sicily!” Just so happens that Francesco and his wife Melissa go to the same Fellowship (Church) that I do. Before leaving for the hunt, early this morning Franseco and Melissa had a prayer time. They asked God for safety for the hunters, for them to enjoy nature, and almost as an after-thought, asked God to let Francesco get a deer. They then had a little chuckle thinking “Yeh right!” But Melissa knows that God is interested and involved in the affairs of His Children. Say what you will, but I don’t think that buck had a chance today. When God tells ya to get on the “ark” you move-right out into an open cornfield, thus fulfilling the earnest prayer from two who are in relationship with The Father. Now I know what your thinking. Everyone reading this is going to be on their knees praying for a buck next time they hit the woods. A word of caution here. It don’t work that way. In fact I don’t really know how it works, and that’s why He’s God and I’m me. I do know that sometimes God answers the most seemingly insignificant things in our lives, that are truly unexplainable, except to say He is intimately interested in having a relationship with us. I for one will continue to seek Him, and bask in the goodness of His love for me in everything, big buck or big doe-no buck or no doe. This is my grand-daughter Princess “Cactus Flower” or Addy, if you prefer. That good looking Indian Chief with her is “Chief 10 Bears!” I was asked to do my Thanksgiving presentation at Mrs. Mary’s pre-school and I always bring up subsistence hunting, where our food comes from, and how hunters use the game that they harvest. I have several skins and hides, such as a deer, and elk hide, and,rabbit, fox, mink, skunk, beaver, and wolf pelts. I even took a package of deer jerky for the more adventurous to try. They also get to see and handle a bear claw necklace, dance sticks trimmed with deer and rabbit fur with a turkey foot attached. I have a drum, made from wood with an animal skin stretched across the drum facing. Arrows with turkey feathers, spears, talking sticks, turtle rattles, and gourds (for drinking.) Depending on how much time I have and how attentive the kids are I have other things like trade beads, tomahawks, arrowheads, pouches, and peace pipes. Eighty percent of what I have I’ve made myself. It’s something I like doing in the winter, along with making the grand-kids walking sticks. My wife has been at it all day long, or at least since she’s been home from work. She made an apple, three pumpkin, a cheesecake, and a special pumpkin for Addy our little Celiac grand-daughter. It’s 12:15 a.m. and I’m waiting on a wild turkey roast I have in the oven. It’s the bird I got this Spring. We also have a store bought bird, and will start that early in the morning. Cut up the celery and onions for the stuffing, and each of the kids are bringing a dish to pass. I went to Mrs. Mary’s pre-school today and did my Chief 10 Bears presentation. My grand-daughter is in the class, and she was my assistant “Princess Cactus Flower.” It was also “stone soup day” at Mrs. Mary’s so everything seemed to fall into place. At the end of my presentation I asked each child what they were thankful for, and most had a good response. Parents seemed to be the number one thing kids were thankful for, but one little guy said he was thankful for motorcycles! Must come from a “biker” family. We all are truly blessed, and we do have much to thank God for. After all that is exactly what the Pilgrims did at Plymouth Rock. They understood that the abundant harvest, and the friendship with the local Native Americans was a gift from their Creator, and he was worthy of their thanks. If you read the history of Thanksgiving you’ll see that the Pilgrims were not the first to celebrate a season of Thanks. In fact on an earlier occasion God was thanked, even though food was scarce and times were hard. The secret of true thankfulness is to have an attitude of gratitude when you have needs, or have plenty. The Apostle Paul had such an attitude, and it should be a Christian virtue in all of Gods Children. From our house to yours may you truly give thanks to God, through whom all blessings flow. Happy Thanksgiving everyone. Sunday was a comedy of errors. I left for my hunting spot around 5:00 a.m. and got there about a half hour before sun-up. The wind was blowing quite hard, and wouldn’t you know it I forgot my hat. I found some ear muffs in my trailer, and they turned out to be an “ear saver!” I sat in a ground blind for 5-1/2 hours, and saw nothing save for a hen turkey. It was colder than I anticipated and I was ready for some hot soup come 12:00 noon. I slept for about an hour and a half, then started getting ready for the evening hunt. I decided to use another stand, as the ground blind sure wasn’t paying off. On my way back to the stand I decided to walk through a small stand of pine trees, located on a little knoll by the pond. There are many blow-downs and thickets in this 2 acres of pines and brush. I was thinking I might jump one laying low in it’s bed. As I approached the perimeter of the pond I thought I could see a bedded deer laying among some downed trees. As I stealthily snuck up to it’s position I could see it was injured. In fact it was so weak it could not even stand up. I am certain this is the same deer that crossed our property Monday the 15th after hearing shots from our neighbors. We sensed that it was wounded, but we couldn’t catch up to it. Anyway I surmised that it had laid here for most of six days, and was probably minutes away from death when I mercifully put it out of it’s misery. Gangrene had set in, so the meat was useless. What a waste! It was a nice little basket racked 9-pointer, and no doubt 1-1/2 years old. Southern Michigan deer can grow impressive headgear in a short time with proper nutrition. After dispatching the emaciated buck I continued on to my tree stand where I sat till dark. I saw another hen turkey and 5 big Tom’s, but no deer. I took a couple pictures of the buck with my cell phone as I had also forgotten my camera. I can’t figure it out, but the deer around these parts are few and far between. I need some snow for a late season bowhunt! When I checked out my Cudde-back last week there was this nice nine pointer on film. Had not seen this deer before, or during gun season. It actually should of been a 10 pointer, but it looks like a point was broken off. There were several deer using this particular “draw” and I also have another coyote jumping through a frame. 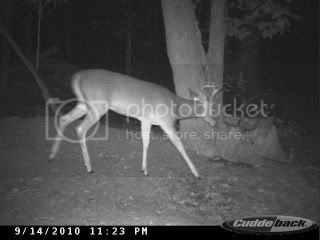 I’m sure he was springing after a deer, as a small doe was on film just a couple minutes before the “yote” showed up. I also have some nice morning pictures of several Tom turkeys. I have a fall permit, but I was never in the right spot at the right time to fill it! Two of the five Gobblers that hang out together, had 11-12 inch beards. I’m trying to break away for at least one day, this weekend, to get back over to Hillsdale, but I’m running into some opposition. Like “You already have a deer. Why do you want another one?” You’d think after all these years she’d understand. Just look at that picture dear, and you’ll know why I want to go back to my cold little treestand in the middle of the marsh! Well there will be venison in the Ansel freezer after all. I shot this big doe Monday morning at 8:30 a.m. and I guess it’s a good thing I did, as I never had another legitimate opportunity. The D.N.R. checkpoint said my doe was 4-1/2 years old, and that is usually not the norm, at least in my experience. I shot her with my Thompson Center 50 cal. muzzle-loader from a tree stand, at about 150 yards. I wrapped the gun sling around my arm and elbow to give me a steady shot and aimed at the center of the shoulder. The 285 grain bullet went through the center of the heart, and she only ran about 40 yards and piled up. I love my Thompson Center! Scott shot a small buck and Tony filled a doe permit, but we all saw bucks. Scott and Tony saw “big” bucks with Scott seeing a bruiser. He had a quick shot in a thicket, but missed. He’ll be dreaming about that one for years to come. I had a decent buck run by my ground blind chasing a doe, but it was carrying the mail, and I didn’t even lift my gun. I had another coyote on my trail cam and also a nice 10 pointer in the same area. We know of a couple bucks being taken around us, but some are left for muzzle-loader season I’m sure. Probably won’t get back out for gun, but I’m anticipating some (snow on the ground) late season bow hunting. By the way Art I still have a cough, but I’m like you, nothing was going to stop me from opening day deer hunting! Hope your felling better, and you “pop” a big one. 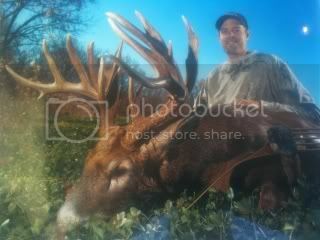 I have a friend named Tom Hedke who for the past several years has been hunting in Illinois. Tom and his crew have been taking some really nice (trophy class) bucks from their property, and two years in a row I have done a post on these big bucks. The above picture is of one of Tom’s buddies named Cal. Cal shot this monster non-typical just last week, and it very well may be the new Illinois state record. The hunt was captured on video, and early reports are that it will score over 220 Boone and Crockett inches. According to reports that I’ve heard Cal is a crack shot with his long bow, as are the other guys in Tom’s group. They have been collecting video’s of their hunts, and from what I have seen it should be very impressive. It is also reported that this buck will be on the cover of “North American Whitetail” next month. The Endorsement Meisters are flocking to Cal’s door with offers he can’t refuse. Way to go Cal. You truly have taken a once in 100 lifetime’s buck. Yes it’s that time of the year again. “Chief 10 Bears” is on the prowl again, and just today visited the children at our local Meadow Montessori School. He was invited to speak at Miss Lisa Abraham’s class where his wife Lorna is the assistant teacher. As you may know my great grandmother was a full blooded Northern Cree from the Wawa Ontario Canada area. We know very little about her, as records were destroyed that would of helped trace her roots. Native American lore has always interested me, and in the non-hunting months of winter I work on making Indian reproductions. Today I showed the class several animal hides, from elk to mink, and everything in-between. I brought dance sticks, talking sticks, gourd rattles, turtle shell rattles, turkey wing-bone calls, deer horn whistles, tomahawks, trade beads, bear claws, arrow heads, and peace pipes, just to name a few things from my collection. Yes there is more. Anyway the children seemed to have a good time, and hopefully learned something about the real first Americans. I had them repeat some Indian words, and they got a kick out of how to pronounce some of the common words, like boy, girl and greetings. I’ll probably do a couple more schools before Thanksgiving if time permits. Niin anishinaabe ogimaawi dadibaajimotaw. It say “I Indian Chief will tell stories.” And I most certainly will “tell stories” around the circle of our precious children again. Please Don’t Feed The Buzzards! The cruel hard fact is not every deer (or other game animal) drops in it’s tracks when shot. That goes for whatever weapon one chooses to use. That is why shot placement is of utmost importance. If your hunting, and do not know the anatomy of the game you pursue, you should stay home and watch t.v. The vitals on this deer total about the size of a paper plate. The angle of the projectile (arrow or bullet) is also very crucial in a good clean kill, and recovery. I prefer a deer to be quartering away or broadside before I feel confident enough to take the shot. The reason I mention this is because the deer in the picture (a nice little 8 pointer) was shot and not recovered by the hunter. The farm I hunt on is surrounded by other properties where people hunt, and evidently a neighboring hunter missed his mark. The farmers wife saw buzzards circling several days ago, and they discovered this 8 pointer dead in one of their thick fence-rows. It was hit to far back which means it did not die quickly and cleanly. I know that is not a popular statement, and all of us experience a “bad” shot or make a less than optimum decision at times. Knowing that this bucks venison went to waste, and there’s a frustrated hunter somewhere should give us all pause next time we are tempted to take a “risky” shot! It’s not worth it! Not only is shot placement and the proper angle important, but a hunter should also know how to track. It is essential to the whole process of being a hunter. The recovery process sometimes hinges totally on the hunters knowledge of his quarry, and his ability to follow a blood trail. In this (tracking) you need persistence and a plan in order for a good outcome. You owe it to the game your hunting, and the sport your involved in, to be the best at what you do. Master all aspects of the hunt and you will to consistently put meat in the freezer, and not feed the buzzards! 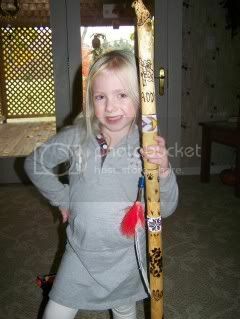 Miss Addy, and her finally completed walking stick. Many years ago I started making walking sticks for my grand-kids with Nadia and Quinn being the first, followed by Keegan and Nina. To say there has been a lull in the action would be an understatement! I’ve had six more grand-kids wondering when “ole” Papa was going to get around to making them one? A few weeks ago while hunting in Hillsdale I took a couple “Beaver Sticks” with me, and started my wood burning, as I settled into my camper for the evening. For those that don’t know a “Beaver Stick” is one I’ve found in the Upper Peninsula around a beavers lodge or dam. They are generally stripped of any bark and have “teeth marks” on either end. They are sturdy and straight, and make perfect walking sticks. I even came up with my own “logo” for the “Beaver Stik” as you see just above Addy’s name. By the way “Stik” is how I spell it. I give each grand-kid an Indian name. Addy’s is “Cactus Flower” and if you knew her you’d understand. I sand, burn, stain, glue, carve, and decorate until I’m satisfied it’s done. Trouble is each one seems to get more elaborate than the last, and rather than a functional walking stick I end up with a museum piece! Well maybe not quite, but there is a difference between the first one I made and the last one. Just completed were Ava’s and Addy’s with Logan, Kyle, Jacob, and McKenzie on the waiting list. It would be nice to have them done for Christmas, but I’m running out of time. I’ll do my best, and just keep whittling away at it!